Mind Glow Media: Ultra-Violent Beethoven: "Huxley's World"
For those who may not be aware, Aldous Huxley is the author of the novel A Brave New World (1932). The book is a literary classic that is considered one of the best fictional works of the 20th century. Set in 26th century London, the novel paints the picture of a world in which every man, woman, and child is a psychologically manipulated automaton governed by advanced technologies. 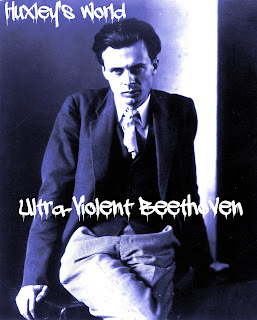 “Huxley envisioned a world that corresponds to the one I live in today,” says Ultra-Violent Beethoven.